Star Wars is more than just a series of movies. Star Wars is more than just a multimedia phenomenon that has lasted for almost four decades. For millions around the world coming from all walks of life, class, religion, or political affiliation, Star Wars is personal. Those people all have a Star Wars story. We all have some way that Star Wars has touched our lives in a profound, lasting way. But Star Wars was more than just something special that I shared with my father. For me, it was and is a foundational touchstone in my life. I have a medical condition that prevents my body from producing testosterone, among other things. It’s a condition that went undetected until I was thirty. The side-effects of this condition meant that growing up I was always heavy. I weighed well over one hundred pounds by the time I was in my pre-teens. I was picked on mercilessly in school. I was a depressed, often suicidal, outcast that hated myself and never felt like I belonged. Star Wars was one of the few things that gave me an escape- a creative, positive outlet. Whenever I felt the deep blackness of depression threatening to drown me I could lose myself in that galaxy far, far away, be it through the movies, novels, or comics, and when I came back I didn’t feel so bad anymore. As a child I could imagine myself living in that universe, wielding a lightsaber and fighting the forces of evil; and as an adult I could imagine myself getting the chance to one day become a writer that might be able to contribute to something that I love so dearly in a way that would last forever. Star Wars gave me hope and joy during times in my life when those things were a very rare commodity. What does all of this have to do with How Star Wars Conquered The Universe? Everything, because author Chris Taylor not only provides us with an impressively comprehensive look at the making of the Star Wars movies and the impact that they’ve had on the entertainment industry, pop culture, and society as a whole, but it also tells the story of us- the fans. The millions of people that Star Wars has impacted in a very personal way. I am not a non-fiction reader. 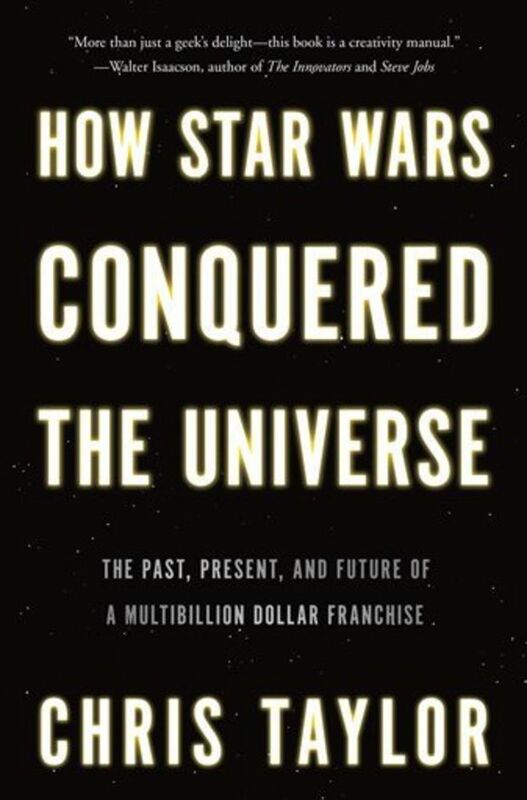 In fact, How Star Wars Conquered The Universe is the first non-fiction novel I’ve read since my early college days more than a decade ago. I am a voracious reader, but I tend to read the kinds of things I like to write- sci-fi, fantasy, superhero comics. I first heard about How Star Wars Conquered the Universe during the Schmoes Know Movie Show when they had author Chris Taylor as a guest. The Schmoes are all huge Star Wars fans and they had nothing but praise for the book, and I was enamored by the stories that Mr. Taylor told during the course of the show. Being a huge Star Wars nerd myself, I’ve watched all the behind the scenes documentaries and read all the various interviews and such about the movies, so I figured I knew pretty much everything that Mr. Taylor might have to say- but I was wrong. Big time. Through the course of the show Mr. Taylor told several great stories from the book that I’d never heard before. I had such a great time watching the show and listening to Mr. Taylor that I had both the book and the audiobook downloaded to my phone that day. Again, I’m not a non-fiction reader, so I was preparing myself for a long slog. While I really enjoyed Mr. Taylor’s anecdotes on the show, I was worried that the book itself would be dry facts that I’d have to constantly break up by switching to other books. Again, I was very wrong. Mr. Taylor has a very engaging voice throughout the entire book. What could have very easily become a dry fact dump was in reality a very entertaining and interesting tale of not only the making of the movies and the behind the scenes drama that was a result, but also the history of “The Creator” George Lucas himself, the background of the various influences on the movies, the impact the movies had on everything, the expanded universe (now “Legends”) that came after, and the fandom surrounding it all. Mr. Taylor breaks up the historical story of the saga with fun, and often touching personal stories about about fan groups like the famous costuming/charity group the 501st Legion and the R2 Builders Club- the fan club who have been tasked with providing the Artoo units being used in the forthcoming Star Wars Ep. VII: The Force Awakens. I cannot express enough how much fun I had both reading the book and listening the the audio (which is wonderfully performed by Nick Podehl). I learned a lot and have gained a whole new level of respect not only for George Lucas and those that worked on the movies, but also for the movies themselves and the massive impact that they’ve had. Chris Taylor lovingly tells the story of Star Wars in this well written, well researched look at the history of the franchise and it’s fans. This is a must-read for anyone who is a fan of Star Wars, or even just fans of films and the film making process. Where Can I Get it? Purchase the book here. Purchase the audiobook here.